“My Great Grand father Samuel and his wife Melissa arrived in South Williamstown in 1876 in a wagon drawn by horses. They bought a farm and began a small dairy. In 1874, living in Hancock Ma only a few miles away and also farming they lost all four of their children in the span of one week from Black Diphtheria. A 9 yr old girl Eda, twin boys aged 4, Sherman and Sheridan, (Samuel had been with the 125thNY Volunteers in the great civil war) and a 2 yr old boy Burton. 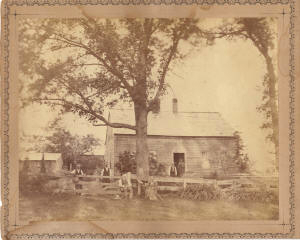 After the death of her last child, Melissa refused to stay at their farm and in 1876 bought the farm in Williamstown. They were to have two more children and the oldest, my Grandfather Robert, was to stay on the farm and have his children, one of which was my Dad. I grew up next door to the old farm house and spent much of my time with my Grandmother who shared old photo’s and stories about the farm and family. She also spent time reading to me from the works of great poets such as Emerson, W. Whitman, Frost and many others. My love of history began even before I could walk. If I could crawl, wedge or fit into it, I needed to know what was in there and my grandmother was always pulling me out of places by my ankles and exclaimed, “I wish Boone, I knew what you were looking for”. I loved playing on the farm, in the old cow barn, the meadows and pastures and in the woods where at age 13-14 with my brother and cousins, cut the logs and actually built a log cabin, about 12’X12’. We spent all our weekends and summers at the cabin and during the winter months cut and stacked firewood in preparation for collecting sap in late winter/early spring to make our own maple syrup, something that had always been done on the farm. I loved everything about the old farm including the early farm tools and implements, and the antiques inside the old house like the Glenwood wood and coal stove, the furniture and kitchen stuff. If it was old I loved it. At age 19 I left for the Army and when I returned, sadly, my Grandmother had sold the remaining land including the farm house and I never got the chance to acquire some of it for my own home. I did however find a beautiful old place a few miles away and finally did build a house of my own which was a colonial of course. I never lost my love of history or antiques and in 1993 I made a career change and started a business selling antiques in a building I also built, which looks like a 18th schoolhouse on property right next to my residence. We can’t know where we’re going if we don’t know where we’ve been.